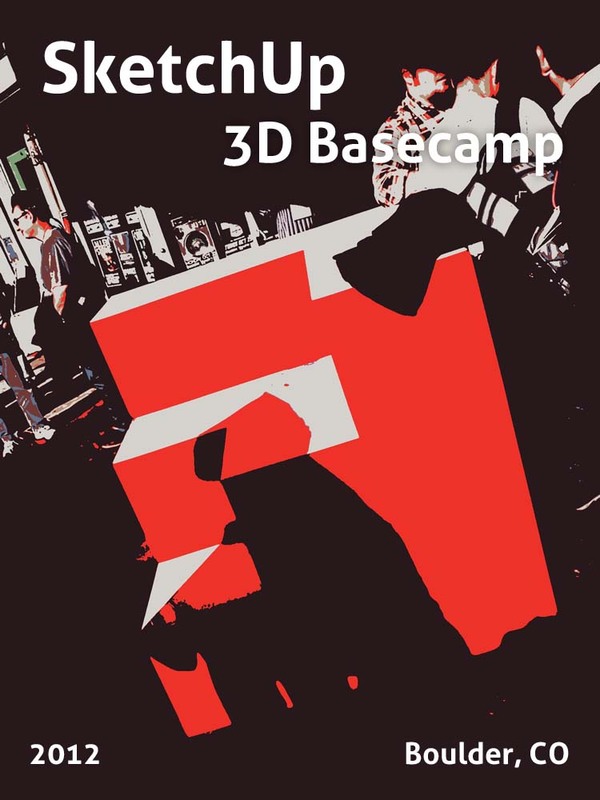 Now that the fourth SketchUp 3D Basecamp is over and the participants are heading home, it’s time to look back and recap some of the news and things that happened at the event. But first I have to say that Trimble’s SketchUp gang has yet again put together an amazing event in Boulder, their hometown. I enjoyed every minute of it and unfortunately had to head back home a bit too early (because of other commitments). 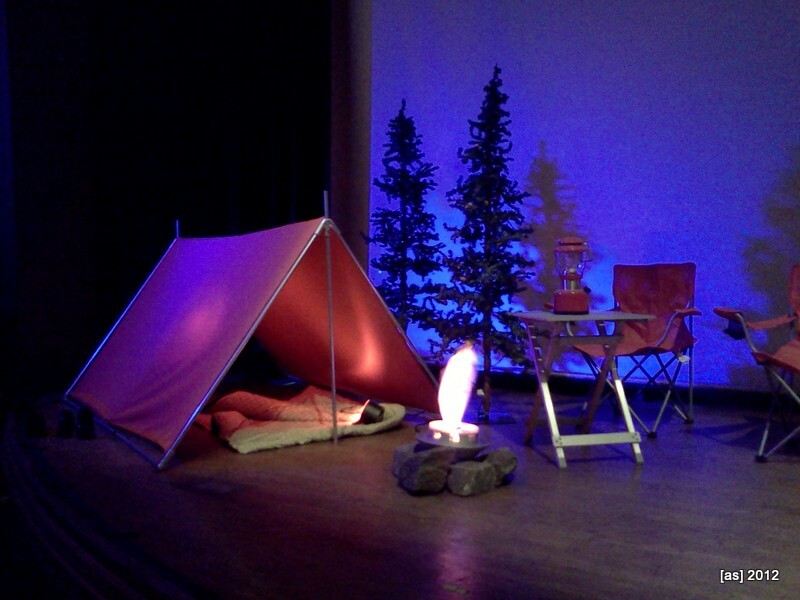 The first day’s presentations were held at the Boulder Theater, a beautiful, historic place in the center of town. After some welcoming words by Aidan Chopra, SketchUp’s Product Evangelist (and untiring organizer of the event), John Bacus, Product Manager for SketchUp introduced Trimble Sector VP Bryn Fosburgh. In his short speech, Bryn assured users how much Trimble is invested (and investing!) 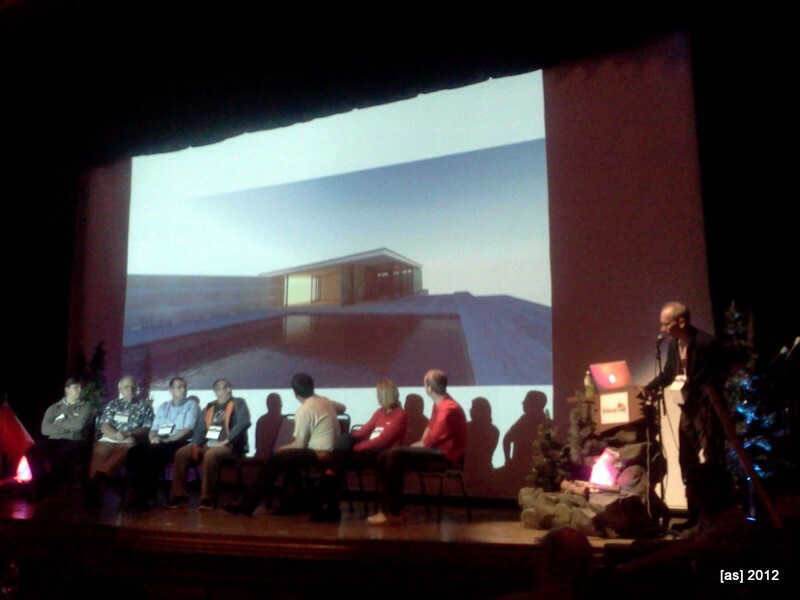 in SketchUp and how SketchUp fills a void centered on Architecture in Trimble’s portfolio. He also outlined how SketchUp will be used as a “platform” for various endeavors and that there always will be a free version. The SketchUp folks are very much working on the next version of the 3D Warehouse. It will include WebGL technology that has already been included in the SketchUp Showcase. 45% of SketchUp users use plugins. Hence, some of the main foci of this event were plugins and Ruby scripting. SketchUp is trying out open-source code development for some of its components. You can already see this happen on their GitHub site. The first project in this repository, released at Basecamp, is a more powerful Ruby Console, the Developer Console. It allows for multi-line editing and is extensible. The second project, also released at Basecamp, is the TestUp software that allows Ruby code developers to use the same unit-testing platform that SketchUp uses internally to test and debug their plugins and other Ruby components. 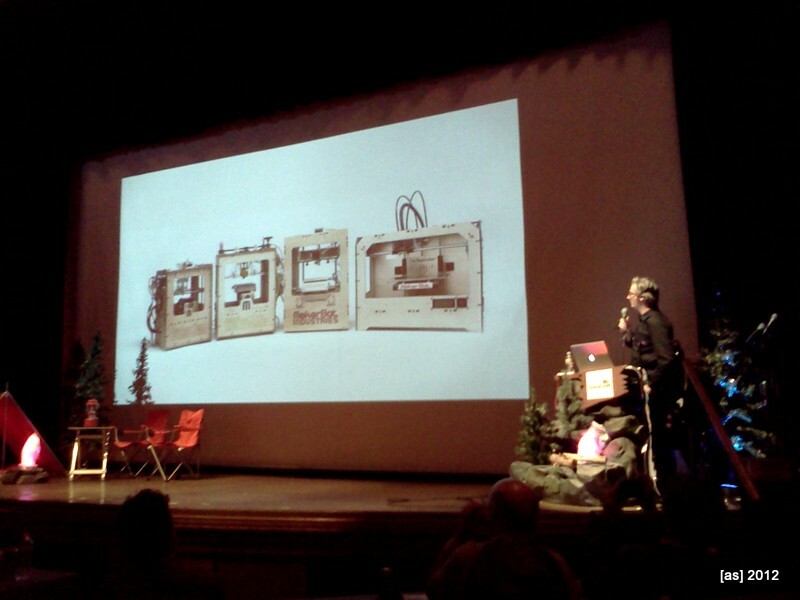 What got the biggest cheers (especially from Bre Pettis, founder of MakerBot), was the release of a STL importer/exporter, also open-sourced in the GitHub archive. It is based on work by plugin developers and makes STL export of models (for 3D printing) easier. There will always be a free SketchUp version and an affordable Pro version. SketchUp is hiring! If you are interested, look here. After these morning presentations, it was time for a boxed lunch and a roundup of rendering software that included Bloom Unit, iRender nXt, Podium, Render[in], Shaderlight, Thea and VRay. Eagerly awaited by everyone in the audience was the next program point – a keynote by Bre Pettis, founder of MakerBot (he is currently on the cover of WIRED magazine). Bre delivered an uplifting presentation that showed where he (and the entire maker movement for that matter) came from and how curious experimentation can lead to great things. He also showcased the MakerBot Replicator 2 (their latest model) and advocated “Made in America” (their 3D printers are made right in Brooklyn). 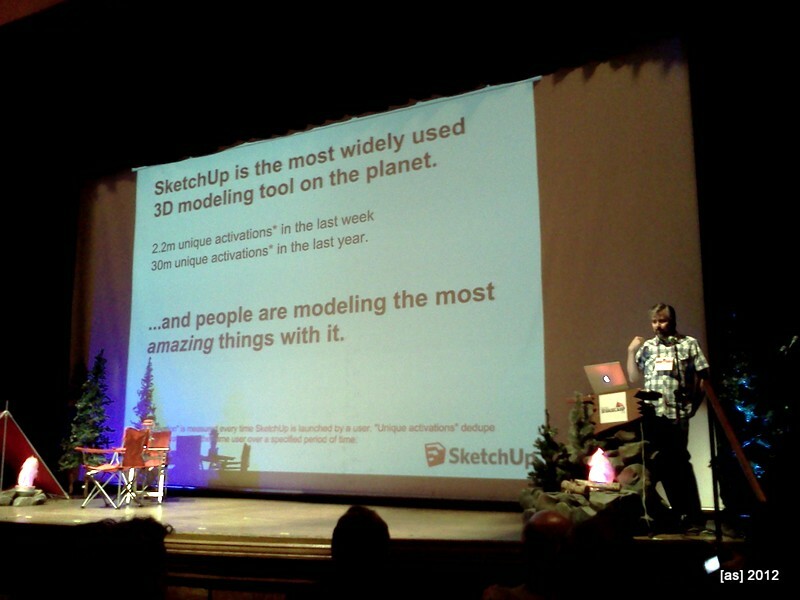 Finally, he emphasized how much SketchUp was “close to his heart”. 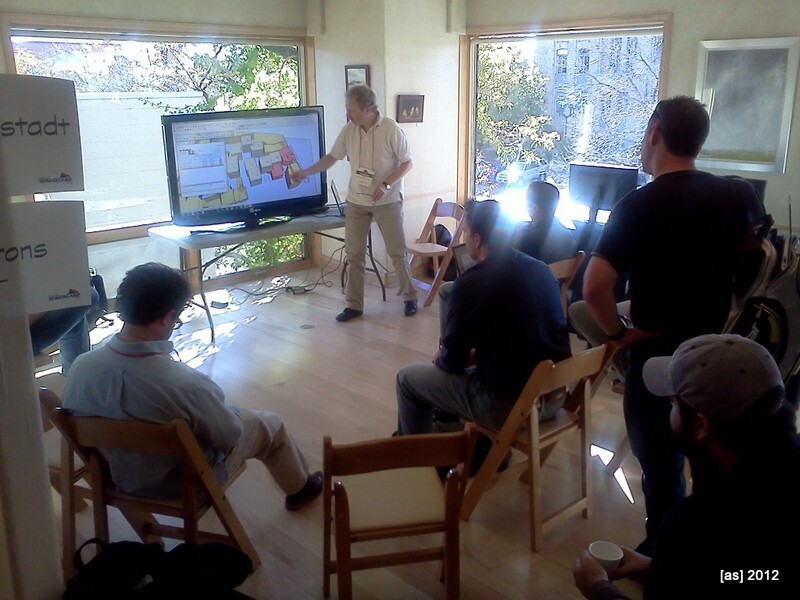 The evening event at Boulder’s Absinthe House was expectably great with the program highlights having been the pitching of Unconference sessions for the next day and a SketchUp-pified version of Pictionary. 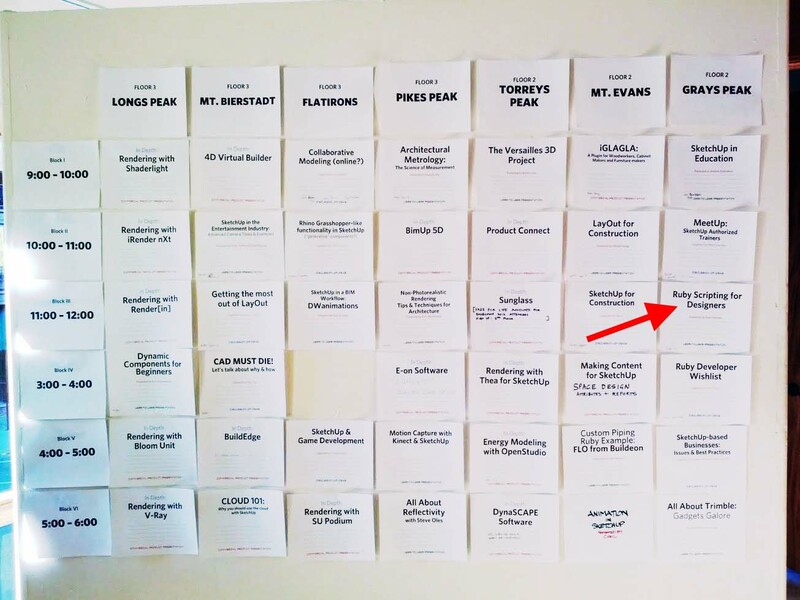 Alternative to these sessions, two “Ruby 101” half-day courses were offered in nearby Hotel Boulderado. The event space at Rembrandt Yard was also filled with exhibitors showing off many of the wares we saw in the first day’s presentations. Below are the slides from my presentation. You can also download them as a PDF here. As you can see in the last slide, my presentation gave a preview of some of the topics that are included in my forthcoming book “Architectural Design with SketchUp” (release date is November 14th).